The challenge will be to walk the talk and ensure a true opening up of European markets to African trade. And to ensure that this new focus on Africa is not just about keeping migrants out of Europe. Take the recent acrimonious exchanges between Italian Interior Minister Matteo Salvini and Luxembourg’s Foreign Minister Jean Asselborn on African migrants. And the “Little Mussolinis” comment made by Pierre Moscovici, the EU’s Economics Affairs Commissioner, to describe the Far Right politicians strutting across the European stage. After years of humming and hawing, procrastinating, just over two-thirds of MEPs voted last week in favour of a motion declaring that Hungary is at risk of breaching the EU’s core values. The vote triggered the Article 7 disciplinary process that could in theory see Budapest stripped of its EU voting rights. Poland, itself currently facing Article 7 proceedings launched by the European Commission, clearly isn’t going to say yes to any such decision against Hungary in the EU Council. Still, the political importance of the Parliamentary vote shouldn’t be under-estimated. It proves, for one thing, that there is no hiding place. The intra-EU divide over values including democracy, rule of law and human rights is out in the open, visible to the world. Hungarian Prime Minister Viktor Orban made clear in Strasbourg that he won’t back down in his pursuit of an “illiberal democracy”. Others won’t step back either from reaffirming their commitment to what the EU’s founding fathers believed in. Now three questions dominate: Will the European Peoples Party move to expel Orban’s Fidesz? EPP leader Manfred Weber, who is also running for the European Commission presidency voted for the motion against Hungary. But other members of his Christian Social Union did not. 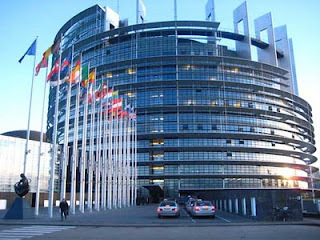 Ahead of the European Parliament elections in May next year, the challenge facing mainstream politicians is to take back ownership of the European narrative from the Eurosceptics and populists. They can only do this if they stop embracing and thereby amplifying the populists’ toxic views. European citizens want to hear another more positive drumbeat about Europe. Negative narratives are debilitating, untrue and soul-destroying. Juncker’s reference to Africa as “Europe’s twin continent” is significant as is his comment that Africa needs a new Alliance for Sustainable Investment and Jobs and a continent-to-continent European African trade pact.